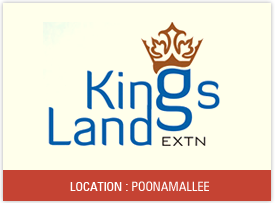 Home > New Projects - Central Chennai > To The King of All Kings A Land That’s Just As Valuable As you are. To The King of All Kings A Land That’s Just As Valuable As you are. ABI Group is a Leading Real Estate developer in Tamil Nadu. 1.2 Crore Sq. Ft. Approved Land Sold. ABI Group Developed 106 Projects. 14 Fruitful Years in Service. 8 Times Best Customer Service Awards.